Welcome to my Project 40 – Te Araroa Trail blog page. 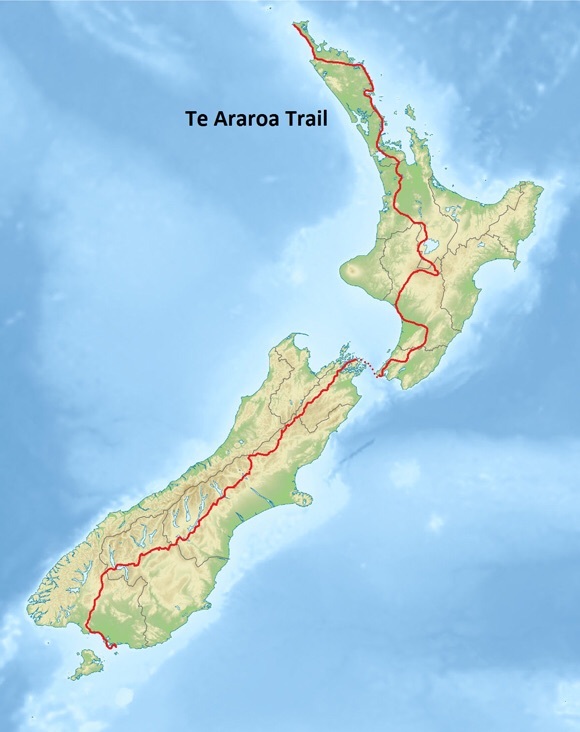 From early November 2015 I will set off on a solo tramp following the Te Araroa “the Long Pathway” in New Zealand. I welcome you all to come and join me along the way – virtually or physically. Read my blog to keep in touch with how I’m traveling or share the experience first hand by walking a section/s with me. “Project 40?” I hear you ask – Project 40 was a concept I came up with a few years where I made a promise to myself to take on something epic before my 40th birthday. Te Araroa is this project coming to life. Te Araroa is Maori meaning ‘The Long Pathway’. It is commonly known in the tramping world as the TA. It is a continuous 3000 km (1800 mile) path stretching from the Cape Reinga lighthouse at the tip of the North Island to Bluff at the bottom of the South Island. Extending for such a distance Te Araroa winds it’s way across remote wind swept beaches, impenetrable forests, mountain uplifts and high mountain passes, lakes, grassy valley plains, estuaries and suburbia. The trail is designed to showcases the natural, cultural and historic beauty of New Zealand experiences. Te Araroa’s boundaries are the natural boundaries of New Zealand itself. Te Araroa was the brain child of Geoff Chapple who advocated for a long distance trail across NZ back in 1994. Through Geoff’s tireless work in forming the TA Trust to work with government and private landholders alike and proving the viability of the TA by walking the length himself, the trail officially opened in Dec 2011. The trail grows in popularity each year and is fast establishing itself on the world scene along side long distance thru hikes like the Appalachian Trail and Pacific Crest Trails in the United States. It is difficult to gauge the number of people starting and reaching the end of the TA each year but based on the number of blog postings by people who started the trail in 2014-15 I estimate their are around 30-40 who attempt it annually. Good question. I’m not quite sure but estimate around 120 to 140 days, roughly 4 months end to end. There are two general responses I get from people when I tell me of my plan to walk the length of a country. The first is “awesome!”, the second is “why?”. Most people get the reasons I’m doing this but for those that question why, all I can say is if you have to ask, then you’ll never understand. There is more to life than 9 to 5. How many opportunities do we get these days to take a long break from the daily grind, forget the world and clear the mind? Not very often, unless of course we’ve quit work, been fired or retired and have the means to support ourselves for a length of time. Too often I’ve seen colleagues amass long service or recreation leave and not do a damn thing with it other than potter around at home or take it all at the end of their careers without the ability to enjoy it like they should. I want to live life now, while I can. While I have the means, while I have age on my side and some fitness left in this body of mine. Deep within my soul I have an unrelenting need to break the chains of normality, if only for a short while and embark on an epic adventure now, not in the future. Life is way too short – live it while you can. Ultimately the lessons we learn about ourselves when we get back to basics, taking on a minimalist approach to life, are the lessons and memories that we hold onto forever, the ones that make us stronger, more courageous and better rounded people. So why Te Araroa? I’ve been kicking around the idea of a long distance thru-hike for a couple of years and was originally set on tackling the Appalachian Trail in the US. And while there would have been a heap of new people to meet along the way to share the experience with on the AT, it would have been difficult for friends and family to join me half a world away. The TA on the other hand is a 4 hour flight across the ditch and much more accessible for people back home to visit and join me if they wish – for a long weekend, a week or perhaps an entire island. It’s really not that easy to find someone to embark on such an adventure with. Not many people tramp TA in the first instant and it’s a major decision for anyone to decide to walk for four months – carrying everything thing you need on your back, sleeping rough and walking an average of 25km a day. However, the trail is growing in popularity and there will be sections where I’lI meet up with other trampers. So, I will start this mission solo but I am really looking forward to meeting other like minded people along the way, sharing the experience and forming friendships for life. Traveling on a single trail over a long period of time I’m expecting to run into people off and on. On similar trails in the states ‘trail families’ form – a loose collective of hikers that form, split and reform with other members or when catching up again further down the line. The TA is not quite at that stage yet but based in the class of 2014/15 blogs this is certainly starting to develop. A few tight groups formed last year and saw each other through large sections of the trail. People for the most part are fairly awesome and New Zealander’s especially. I’m also hoping that friends and family will join me for sections along the way. Mick, not sure how often you check this, but I’m headed to hike the TA at the end of the month (Northbound). I’ve hiked the A.T. (2005) and PCT (2012) and was going to do the CDT this year, but felt like the TA would be a better option. Just wanted to say that I’ve enjoyed reading your blog and have gotten some great insights for this particular journey. Wish you the best of luck and hope our paths cross. Hi Mick…..loved the doco and beautiful scenery on the trail….I was wondering if you had the time to answer a few questions I have, and perhaps a bit of advice too? Thanks Mick….there’s quite a few different issues I’d like to discuss, eg gear choice, preparation, logistics and probably a few more. Would it be better to email me do you think?